The enormous ocean is one billowing wave. 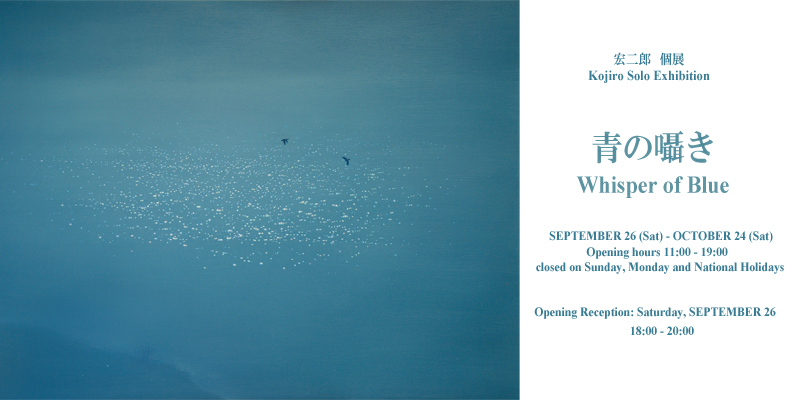 Kinosho Kikaku is honored to present to you Whisper of Blue – Kojiro Solo Exhibition, featuring series of new works that delicately portray the unique worldview of Kojiro. In contrast to the human world where everyone and everything is closely connected yet completely alienated, where miscellaneous thoughts and ideas intersect and collide, the great universe embraces each and all of us gracefully. Some studies have found that the very first sign of life on earth might be originated in the ocean. While ultraviolet rays and charged particles pour mercilessly on earth, the ocean was the only environment that allows life’s existence under such fatal condition. Ultimately, the form of life arose from the ocean. From then on, a cascading chain of new and increasingly differentiated forms of life appeared all over the planet. Mother Earth has gradually evolved to the way we know it. In such sense, for us human beings, the sea is like the uterus contained of warm fluid. The consciousness of self and others, the existence of justice and evil vanishes among the deep, limitless sea of peaceful blue. Kojiro believes that the color of blue is the earth and the universe. The life forms arose from the blue ocean live on within us as we are still tenderly embraced by the great universe. In other words, we are part of the ocean, our mother earth and the universe. The limitless universe that seems so distant from us, the infinite, deep sea of blue, you and me, aren’t we all tied closely with each other by an invisible bond in the abyss of the universe? In this very exhibition, Kojiro has transformed the whisper of the blue that comes from the far-away universe and the ocean into visualized forms. We sincerely hope the echo can sublime from the vivid canvas and reach deep down into the abyss of your heart. 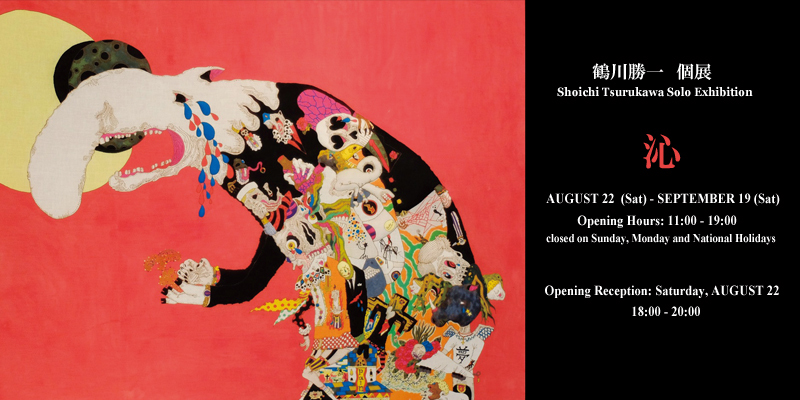 Kinosho Kikaku is delighted to present to you Shoichi Tsurukawa’s solo exhibition. 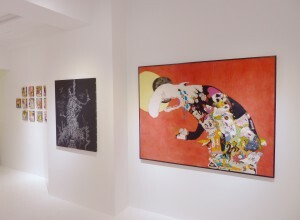 With his bold use of colors and distinctive techniques, Tsurukawa’s works contain an exceedingly forceful personality. It is as if he has carefully captured and stained every bit of momentary emotions that often fill his heart with vivid colors, and condensed them onto one single pictorial scene. According to Tsurukawa, he is often indulged in the colors of emotions. Being extra sensitive to the colors of happiness, anger and grief, he is always drawn by the vividness of his own emotions, which is portrayed thoroughly by the density and richness of colors in all of his works. The reason he chose staining as the main technique in his creation of works is that the transition of the colors is able to reflect the flow of his emotions in a more realistic manner. “My works are like the crushed rubbles of my aspiration and fate from the brutal reality.” The aspiration and fate did not go weathered. Through his own hands, they have transformed into rubbles and continue to pile up along his journey of life. This very exhibition will be showing a number of new and old works of Tsurukawa. We hope that through the stained “rubbles” of emotions portrayed in his works, you are able to meet Shoichi Tsurukawa as a human being and hopefully, discover the “something” that lies underneath our skin.